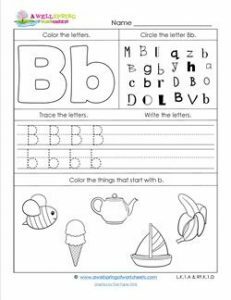 Kids will have a fun time with this letter b worksheet from our abc worksheets set. Have them grab their pencils and crayons and have a go at it! Color the things that start with b and the big letters. Use their pencil to trace the letters and write a few more. Don’t forget to circle every C or c in the box with all the letters. Though it’s not written on the page, go ahead and see how many B’s are on this page.